Cobia, Rachycentron canadum also known as Lemon fish or Ling is an oceanodromous, migratory and pelagic fish that lives in brackish and marine waters. The fish is popular known by the common names-Cobia, Black kingfish, Black salmon, runner or sergeant fish, crab eater and Sea murrel . It is a highly priced game fish with high market value both in domestic and international markets. Cobia known for its excellent meat quality is a famous premium food fish highly preferred by people in Taiwan and Japan. The white meat of the fish is served in restaurants as raw fish called Sashimi. The fast growth rate, adaptability to captive breeding (attains 6-8 kg/year) are the major attributes which makes cobia as an excellent candidate species for aquaculture . 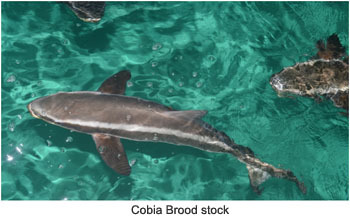 Cobia is one of the marine finfish species with high aquaculture potential particularly for cage culture in India.